What ELON MUSK and the SPACE X TEAM has done with the successful launch of the Falcon Heavy vehicle was amazing. More amazing was their use of the Tesla Roadster and a dummy astronaut – STARMAN – as the payload. With live camera feed, this launch captured some magical moments in space with the Earth in the background. So magical, it reminded me of that famous MOON CYCLE scene from Steven Spielberg’s blockbuster E.T. – The Extra Terrestrial. See below how closely the moment matches the famous moon cycle scene from ET. Tesla Roadster flying over the Earth similar to ET cycling with the Moon in the background. Why did George Lucas sell Lucasfilm including STAR WARS franchise to Disney? Why did George Lucas suddenly sell away all rights to Star Wars to DISNEY? And too add, Indiana Jones? And also my favorite visual effects company: Industrial Light and Magic (ILM) ? Just $4 Billion? Sounds small? Being a cash plus stock combo sale, Lucas has become the second largest independent shareholder of Disney, holding more than 2% equity. So ALL future profits of Disney from Star Wars, Indy Jones series will CONTINUE to add to Lucas’ fat wallet, as Disney will make multiple reboots and sequels. That Lucas struck a deal in 2012 may be no accident either, advisers say. Long-term capital gains tax from the sale of assets held more than one year are taxed at a rate of 15% for investors in the 25% income tax bracket or above (Lucas’s level), and zero for investors in the 10% or 15% bracket. Those rates are set to jump to 20% and 10%, respectively in January. “He probably wanted to take advantage of the lower rate on long-term capital gain while it’s certain,” says Bill Smith, managing director at CBIZ MHM, a national accounting and professional services provider. The Force… is pretty strong in George Lucas! If you are a movie producer and spending INR 40 Crore minimum on making the movie plus another INR 20 Crore on marketing the film, which Bollywood Star would you hire to ensure you get your Box Office returns? She has become the only actor or actress to give 3 back to back movies which grossed INR 100 Crore at the box office! The only other actor who can come close is of course Salman Khan with 3 back to back box office successes in “Dabangg”, “Ready” and “Bodyguard”, but “Ready” didnt gross INR 100 Crore. Small wonder that the trade press has coined her a new nickname in the industry: “The 100 Crore Heroine”. Kareena Kapoor dancing to “Chammak Challo” song from the movie “Ra.One”. Click to download the full wallpaper. It is not surprising that Bollywood’s most expensive movie to date, “RA.ONE” has also ensured their marketing features Kareena Kapoor (the lead heroine in the film opposite Shahrukh Khan) prominently in the songs/item numbers which are now the defacto marketing tool for Bollywood movies replacing the traditional “trailer” format nowdays on TV. With India’s widest release in history at more than 3500+ screens, even a 70% occupancy on the opening weekend for Ra.One (which is a given for any “Khan” movie nowadays), will bring almost INR 120 Crore + collection, making it the FOURTH successive “100 Crore” movie for Kareena Kapoor, a record which is pretty difficult to break. UPDATE 31-Oct-2011: Ra.One breaks BO record with Rs 170 cr collection (IBN LIVE). The highly anticipated Diwali release triumphed at the box office with an incredible weekend gross collection of Rs. 137.25 crore (Net Collection of Rs. 96 crore) in India and Rs. 32.75 crore overseas. This makes it Kareena Kapoor’s fourth successive “INR 100 crore” film, an enviable box office record for any actor or actress in Indian cinema. Whip up a frenzy. “Audience equals money”. Feed them daily. The Twin Drugs. A spoon of Fear and a plate of Anxiety. Breaking News! Whither the Wise? Create Panic first. Then Anger. Print in Color. Malign in Black or White. Hungry Mobs. Pack of Wolves. “Change Change” “Our Time is Now”. Mass Hysteria. Weapons they sought. “Viva La Revolucion” is the shrill war cry. “They are Different and not us”. Imaginary Enemies. Hang them out to dry. And The Reichstag is set on Fire. Karan Johar’s Dharma Productions has landed the film rights of Amish Tripathi’s best-selling debut novel, The Immortals of Meluha. The book had attracted much attention since Amish announced he was on the lookout for a producer to adapt his book. Producers from Hollywood and Bollywood were vying for the film rights, even as his second book in the Shiva Trilogy,The Secret of the Nagas was launched. Says an insider, “Karan credits the buying to the CEO of Dharma Productions, Apurva Mehta, who had been negotiating for the book rights for months.” The emotional content and the love story between Shiva and Parvati are very strong elements in the novel. Karan will look into finer details, apart from the screenplay. Since it deals with religion and mythology he will make sure that the subject will be treated with sensitivity. Says Karan, “I was blown away with the world of Meluha and rivetted by Amish’s creation of it. I think the book lends itself beautifully for celluloid and we are very excited to promote Amish’s labour of love effectively.” Now the big question is who is going to direct a film of this magnitude from Dharma and which big star will play Lord Shiva and Goddess Parvati? 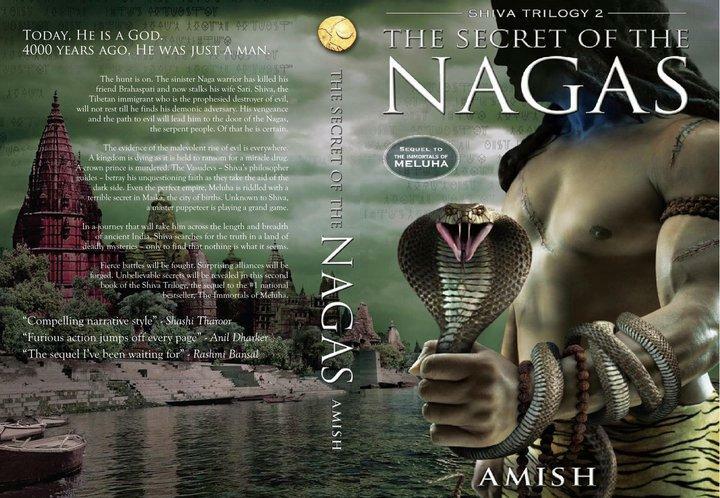 Update: 9th Aug 2011 – The new video trailers for Amish’s adventure fiction titled The Secret Of The Nagas (which is the second part of the Shiva Trilogy) has just been released! The Shiva Trilogy trailers have now become a digital media event thanks to the breakout hit of the first part “Immortals Of Meluha”. Watch the trailers for The Secret Of The Nagas book launch made by ad agency Think Why Not and film makers Amit Pandirkar and Shibu below. About “The Secret of the Nagas” – The Secret of the Nagas is the second book of the Shiva Trilogy, the sequel to the No 1 national bestseller, The Immortals of Meluha. Shiva’s hunt for the Naga who killed his friend Brahaspati and targeted his wife Sati, takes him down India’s major river networks, searching for traitors and seeking allies in his war against evil. But evil is rising again, more potent than ever. A whole nation is dying. Another, suffering for no fault of its own. Everyone is suspect: new friends, old allies and even his philosopher guides. At every corner, Shiva finds evidence of Naga activity. A crown prince is murdered. A people held to ransom for a miracle drug made only by the Nagas. Shiva’s journey takes him across the length and breadth of Swadweep, to the land of the Brangas and further south, deep into the Dandak forest. Shiva searches for the truth in a land of deadly mysteries — only to find that nothing is what it seems. Book 2 of the Shiva trilogy takes up from the point where Shiva is dashing to save Sati at the end of The Immortals of Meluha. Does he succeed? His archenemy seems to be winning every encounter. All Shiva knows for sure is that the Chandravanshis aren’t evil. But then, neither are the Suryavanshis. So who or what is evil? And who is the mysterious Naga that stalks his family? What does he want? What is The Secret of the Nagas? To know more, buy the book now on Flipkart ! Below is the much talked about cover of the sequel: The Secret Of The Nagas. Today, He is a God. 4000 years ago, He was just a man. The hunt is on. The sinister Naga warrior has killed his friend Brahaspati and now stalks his wife Sati. Shiva, the Tibetan immigrant who is the prophesied destroyer of evil, will not rest till he finds his demonic adversary. His vengeance and the path to evil will lead him to the door of the Nagas, the serpent people. Of that he is certain. The evidence of the malevolent rise of evil is everywhere. A kingdom is dying as it is held to ransom for a miracle drug. A crown prince is murdered. The Vasudevs Shivas philosopher guides betray his unquestioning faith as they take the aid of the dark side. Even the perfect empire, Meluha is riddled with a terrible secret in Maika, the city of births. Unknown to Shiva, a master puppeteer is playing a grand game. In a journey that will take him across the length and breadth of ancient India, Shiva searches for the truth in a land of deadly mysteries only to find that nothing is what it seems. Fierce battles will be fought. Surprising alliances will be forged. Unbelievable secrets will be revealed in this second book of the Shiva Trilogy, the sequel to the #1 national bestseller, The Immortals of Meluha.